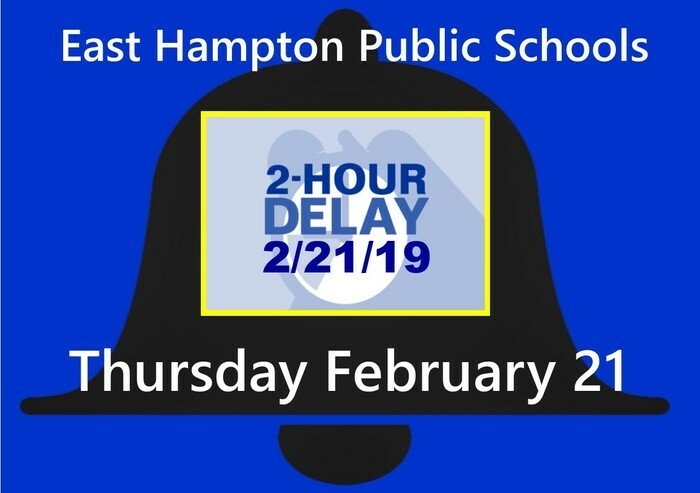 East Hampton Public Schools will have a TWO-HOUR DELAY on Thursday, February 21. 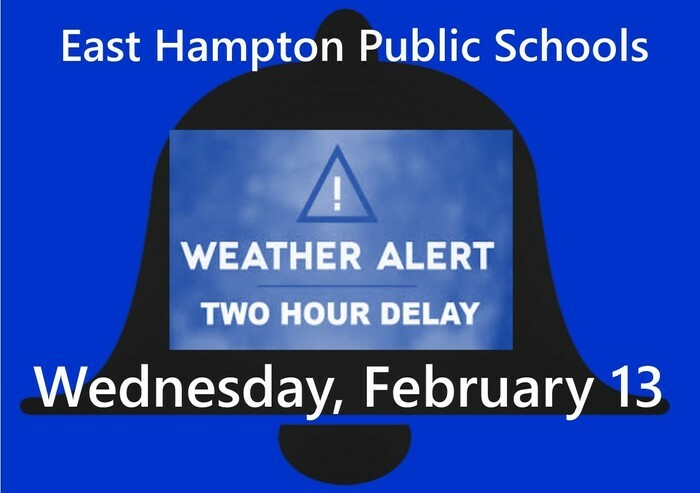 There will be a TWO-HOUR DELAY for the East Hampton Public Schools on Wednesday, February 13. 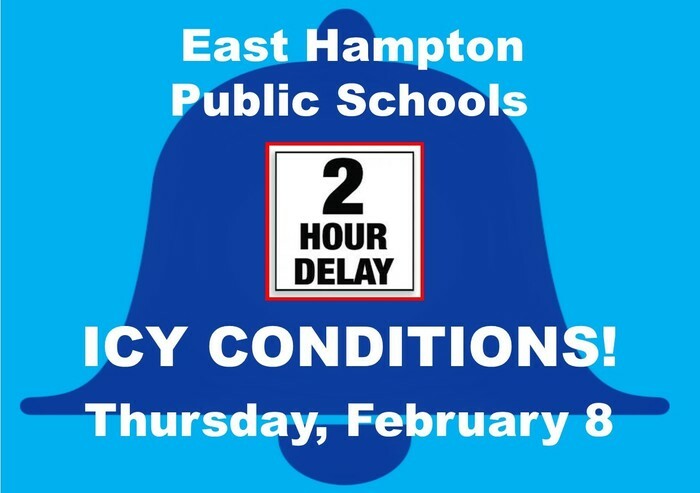 Thursday, January 31 - There will be a 2-hour delay for the East Hampton Schools. Please make sure that you are dressed for the cold! 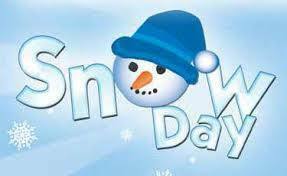 Wednesday, January 30 - ALL after school activities are cancelled. There is the potential for snow squalls and immediate freezing and black ice on the roads after the squalls. Use caution on the roads tonight! 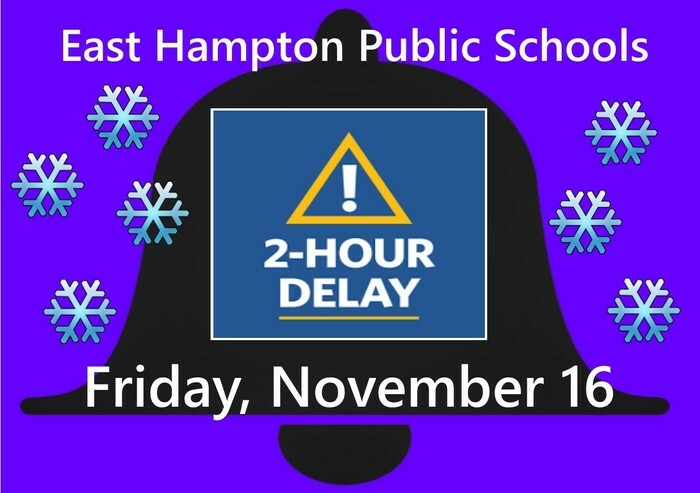 TWO HOUR DELAY for the East Hampton Public Schools on Friday, November 16. Be safe on the roads this morning! 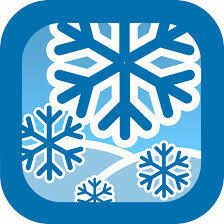 11/15-All school activities scheduled after 4:00 PM are cancelled. Middle School Conferences will end at 4:00 PM. The High School Concert has been rescheduled to Thursday, November 29 at 7:00 PM. Book discussion with the Superintendent on Carol Dweck's MINDSET at 94 Main Street at 6:00 PM. Come and join us even if you did not read the book! Welcome back! Another year of school - with chats over coffee - has begun! Please join the Superintendent of Schools, Paul Smith, for coffee this Friday, September 7 from 7:30-9:00 AM at 94 Main Street. We are getting excited for another school year. We look forward to welcoming teachers and staff back on August 28 and students on September 4! See you soon! Have you been to coffee with the Superintendent of Schools, Paul K. Smith? You should stop by 94 Main between 7:30-9:00 AM. We're changing the world! 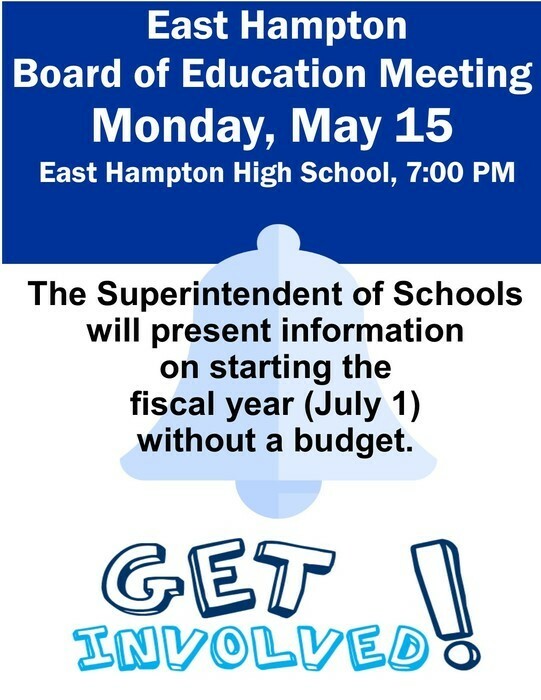 East Hampton Public Schools are committed to excellence regardless of any budget cuts. We are a "no excuses" organization! Come and be part of the change! Wed, March 21-EARLY DISMISSAL for all schools. 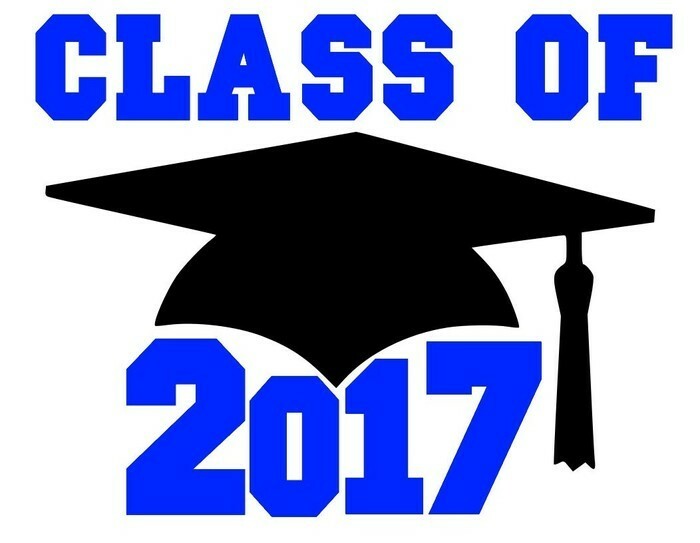 NOTE: We are dismissing earlier than normal-11:10 High, 11:35 Middle, 12:10 Center/Memorial. 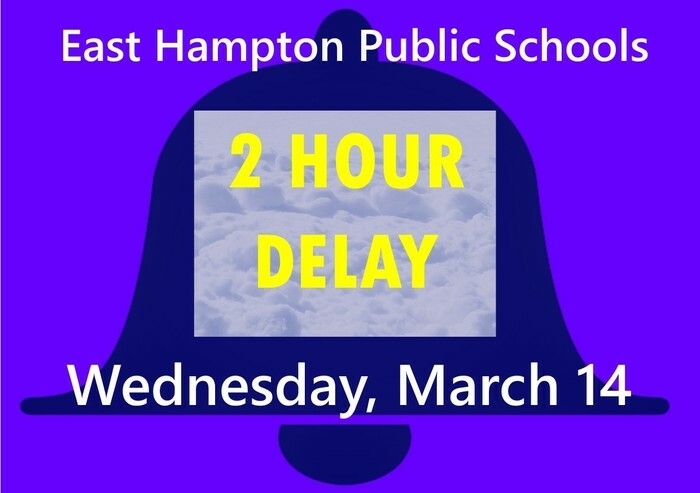 Wednesday, March 14 - East Hampton Public Schools will have a 2-HOUR DELAY. 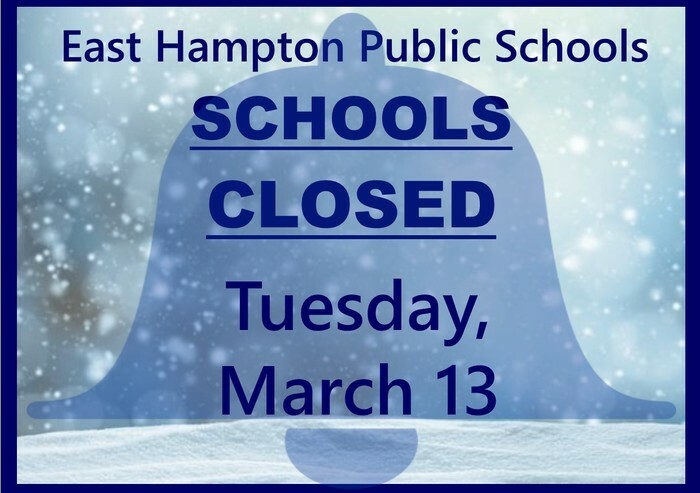 Tuesday, March 13 - East Hampton Public Schools will be CLOSED for today. School remain closed on Thursday, March 8. High School and Middle School without power along with a large portion of the town. Use caution if traveling this morning. 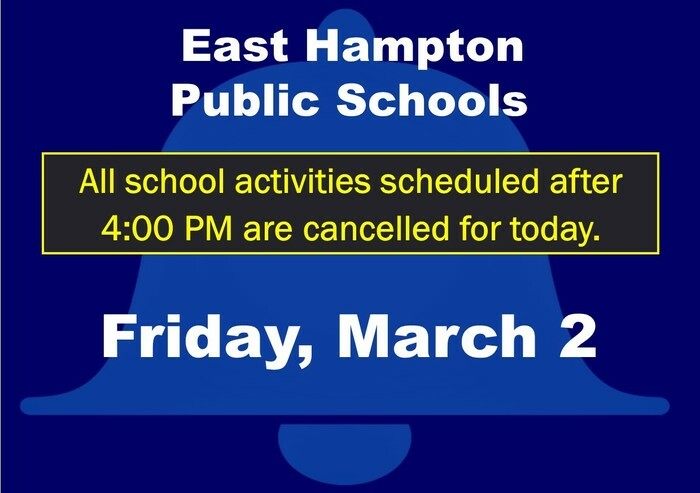 Wednesday, March 7 - East Hampton Public Schools will be CLOSED for today. Friday, March 2: All school activities scheduled after 4:00 PM are cancelled for today including Friday Afternoon Clubs at Memorial School, the High School Boys’ Shoreline Conference Championships, the High School Girls’ Class S State Tournament Game, and the High School Cheerleaders Class S State Championships. 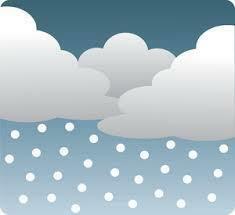 Thursday, 2/22 - Due to potential of ice and sleet, after School activities after 4:00 PM are CANCELLED. 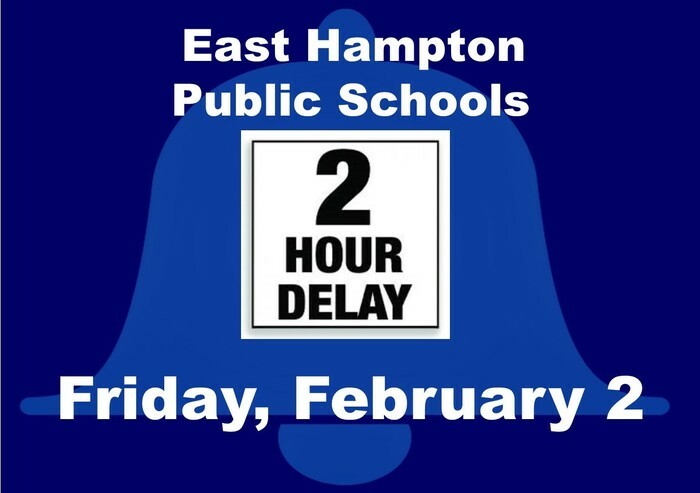 TWO HOUR DELAY for East Hampton Public Schools on Thursday, February 8. Use caution on the roads this morning. Icy conditions are likely on all surfaces. 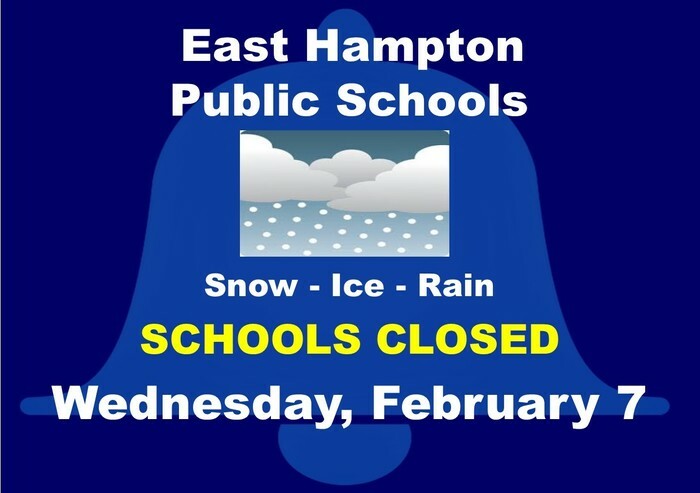 East Hampton Public Schools will be closed on Wednesday, February 7 due to the concern over the timing of snow to ice to rain. TONIGHT! Monday, February 5 - Budget Discussion at the Board of Education Meeting: High School at 6:30 PM. With the unknowns of Municipal Aid based on the Governor's recommendation in the adjustments to the biennial budget, knowing what is in the school budget for 18-19 is an essential starting point! Board of Education meeting tonight (HS @ 6:30 PM). Budget discussion is featured and an introduction to the Smart Start Pre-school! TWO HOUR DELAY on Friday, February 2. Please use caution on the roads this morning. Icy conditions are possible on all surfaces. 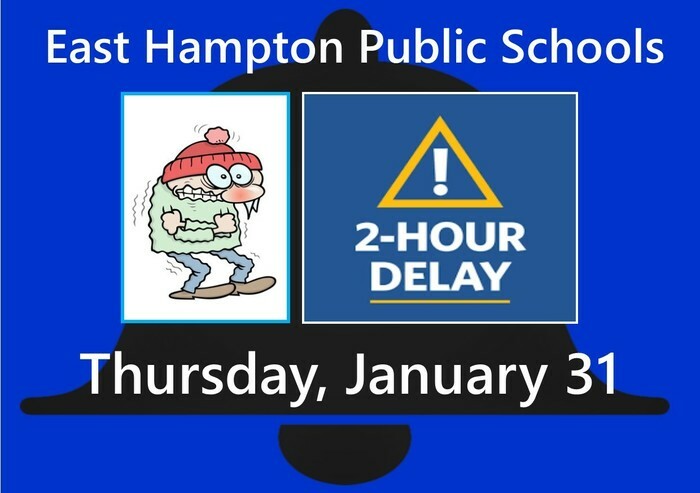 TWO HOUR DELAY for East Hampton Schools on Tuesday, January 30. Be careful on the roads this morning! Budget discussion Monday, January 29 at 6:30 PM. The entire school community is welcome to comment. Don't miss your chance! 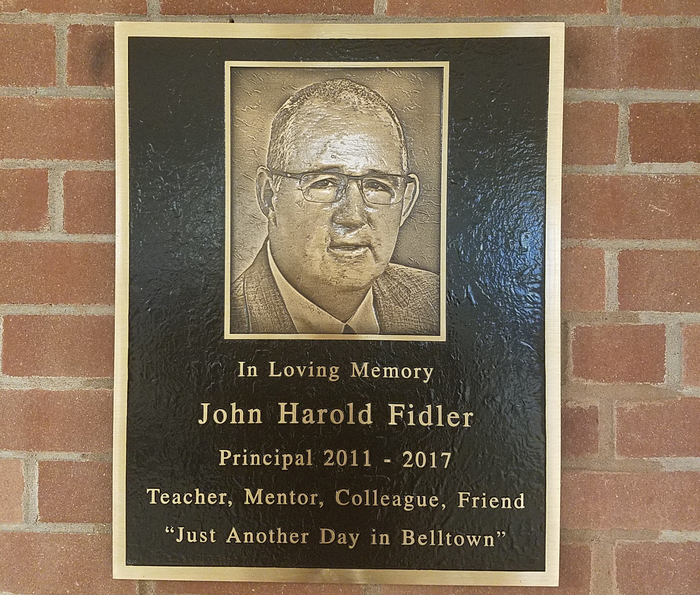 John Fidler memorial plaque and road signs were dedicated on January 26. Proud to be a Bellringer today! East Hampton Public Schools will be CLOSED on Wednesday, January 17. Reminder! TONIGHT, Tuesday, January 16 at the High School, 6:30 PM come for the 2018-19 Budget Presentation and a visit from State Representative Melissa Ziobron for an update on state funding during the Board of Education. Parents and citizens urged to attend. Childcare is available! All school activities CANCELED after 4:00 PM on Monday, January 8. Please use caution during the afternoon/evening commute. The East Hampton Public Schools will be CLOSED on Friday, January 5. 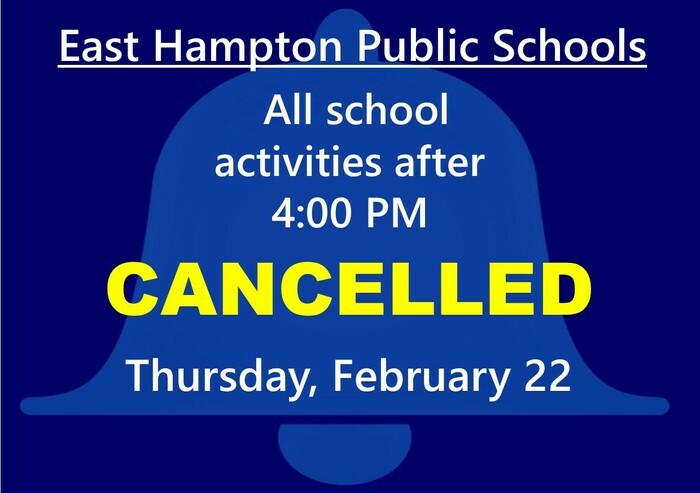 East Hampton Public Schools CLOSED on Thursday, January 4. All day and evening activities cancelled. Weather UPDATE: Due to the timing of this storm, East Hampton Schools will be CLOSED on Thursday, December 14. TWO HOUR DELAY for East Hampton Public Schools on Thursday, December 14. Use caution on the roads this morning! East Hampton Public Schools are CLOSED for the day on Mon, Oct 30 due to road closures and downed wires. Friday, October 27 – East Hampton High School Homecoming Fall Ball in the EHHS Cafeteria, 8:00-10:00 PM. 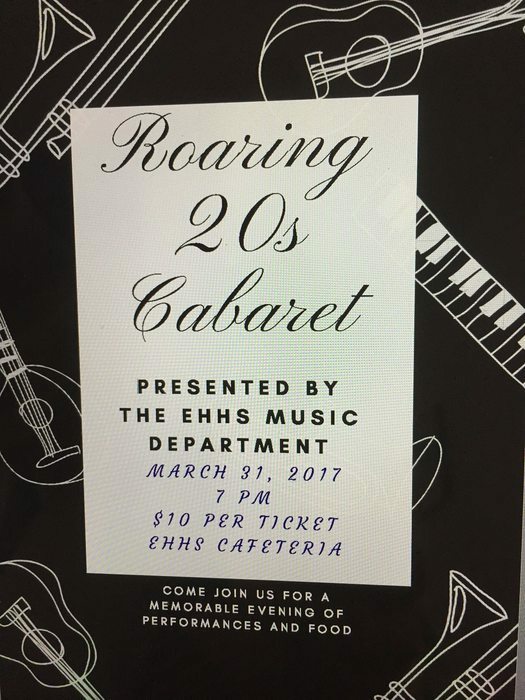 Tickets are on sale Monday, October 23 through Thursday, October 26 and are $5.00 each. No tickets are sold at the door. 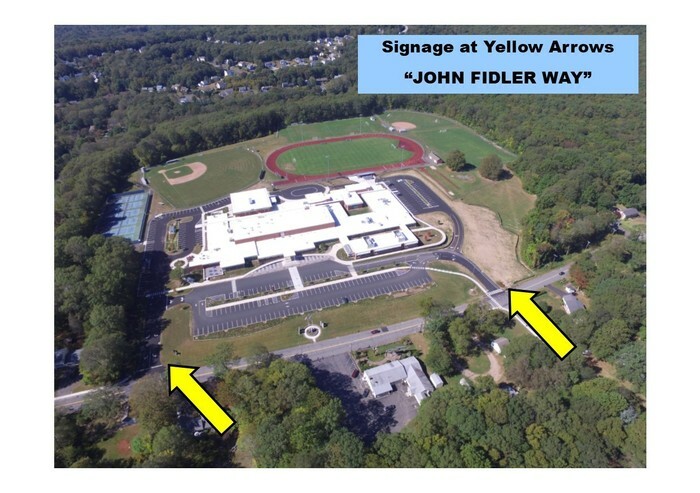 EH Board of Education to name roadway leading to high school as The John Fidler Way. More news to come on a dedication ceremony. In the month of October we are making sure that everyone of our students experiences kindness and caring every day! Tonight, Mon 10/2, we honor our Friends of Education for 2017. We are lucky to have so many individuals who contribute their talents to our schools! Monday, 10/2 is National Stomp Out Bullying Day and we are committed to a day of kindness and caring. Join us! Coffee with the Superintendent-Fri, October 6, 7:30-9:00 AM East Hampton HS Cafeteria Patio - be there! Very proud of our Teacher of the Year, Kristen Keska, who was named a semi finalist for Connecticut State Teacher of the Year! Reminder: OPT OUT Requests due by Friday, 9/22 for school directories. 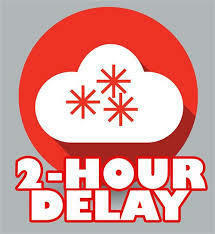 Two Hour delay for East Hampton High School (ONLY) on Wed, 9/20. Regular buses for students who cannot get their own ride. Library & cafeteria open. Panther Fest at Middle School on Friday, 9/22 - Cross Country and Soccer from 3:00-9:00 PM. Don't miss the event of the year! Superintendent's Advisory Council, 9/21-9:00 AM at 94 Main Street. All are welcome for coffee and some great information this month! Congratulations to Kristen Keska - Social Studies Teacher at East Hampton High School. 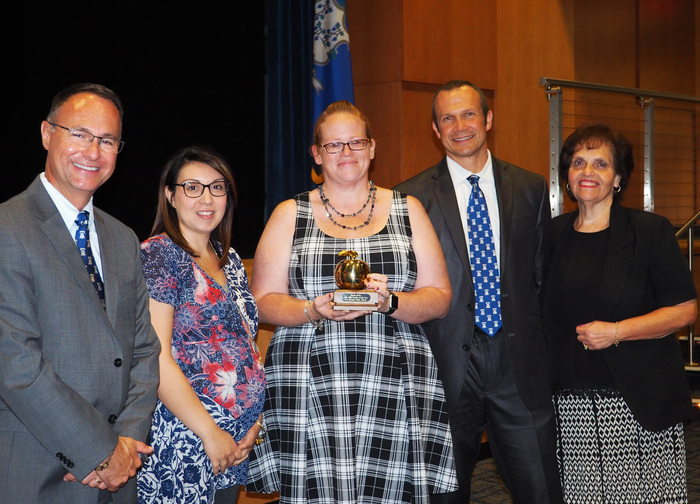 As the East Hampton Teacher of the Year, she was notified that as a result of her application packet, she is now a State of Connecticut Teacher of the Year Semifinalist! Kristen is one of 15 Teachers of the Year from the state to be selected for the semifinals. We wish Kristen the best as she moves ahead in the Connecticut Teacher of the Year Interviews. We are excited to welcome everyone back for another great year in the East Hampton Public Schools! We urge you to attend the Board of Education meeting on Tuesday, September 5 at the High School and hear directly from the Principals about our ambitious goals for 2017-18. If you attend, you'll agree that it's an absolutely AMAZING time to be a learner. (Quote from Will Richardson). School starts on Wednesday, August 30! We can't wait until our students return! Thursday, June 15 is the last meeting of the Superintendent's Advisory Council at 94 Main Street, 9:00 AM. The meeting is open to all parents and community members. It's a chance to sit down with the Superintendent of Schools, Paul K. Smith and ask any question you have about this school and next school year! Do you have a budget question, but can't come to the coffee meetings. Call Superintendent, Paul K. Smith directly, 860-365-4000. Coffee with the Superintendent on Friday morning, 6/9/17, 7:30-9:00 AM at 94 Main. Come and ask any budget question you have! Tri Board meeting tonight (5/22), 7:00 PM in the High School T-Bell features a discussion on the Town and School Budget. Be there! 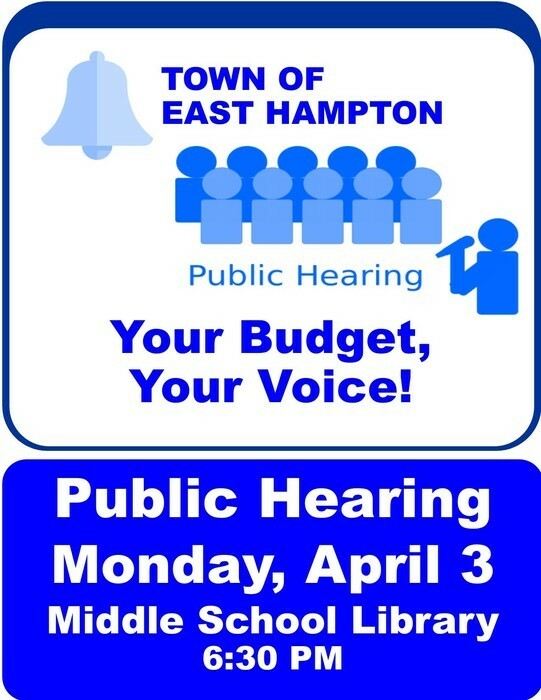 Monday, April 3 - Tonight is the Public Hearing on the Budget. Please join us at the Middle School, 6:30 PM. Your presence is very important! 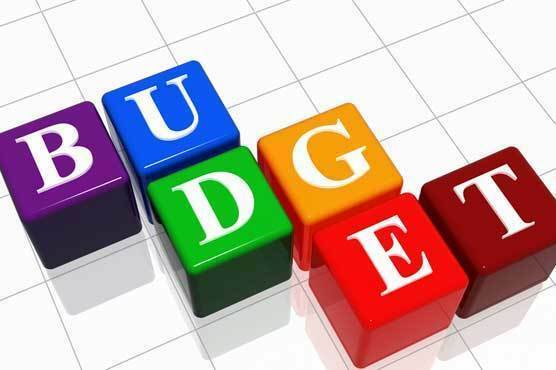 Please note: The Board of Finance Public Hearing on the 2017-18 Budget originally scheduled for Monday, March 27 has been changed to Monday, April 3 in the Middle School Library, 6:30 PM. 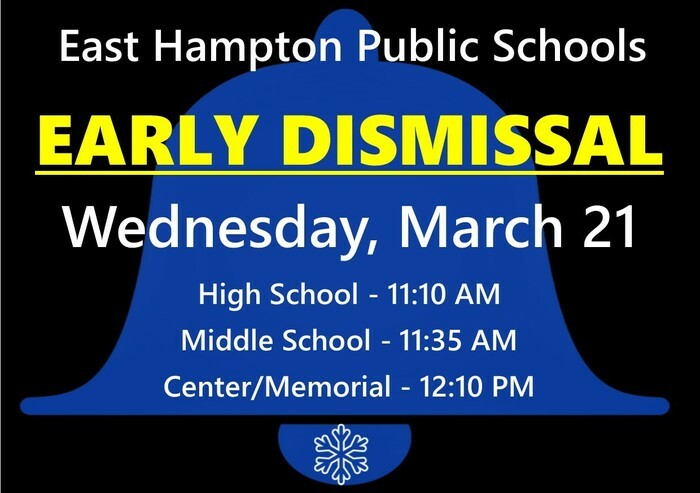 Wednesday, March 15 - There will be a TWO HOUR DELAY for the East Hampton Public Schools. Even though it will be cold for the next several days, hopefully there will be no delay in returning to spring-like weather! 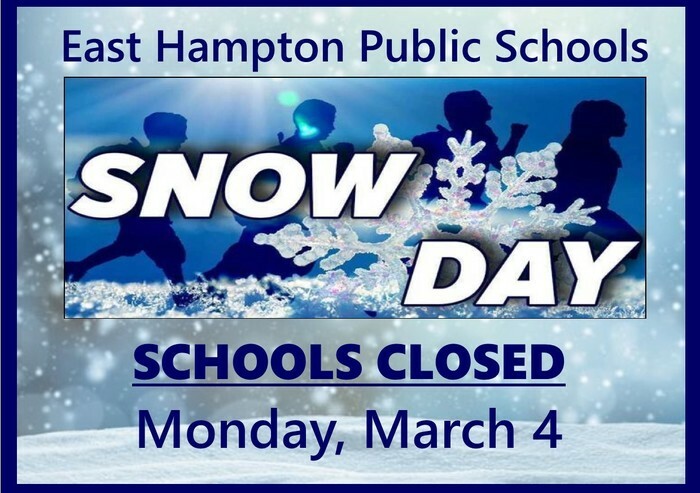 Tuesday, March 14 - East Hampton Public Schools and School Offices will be closed! Stay safe during the snowstorm! Friday, February 24 is East Hampton Volunteer Appreciation Day! Thank you to all of our Volunteers! This Friday’s (February 17) Coffee with the Superintendent will feature a visit from State Representative Melissa Ziobron from 7:00-8:00 AM. (Note time adjustment to accommodate Representative Ziobron’s Schedule) Drink Coffee. Talk Budget. Monday, February 13 - TWO HOUR DELAY for Schools. Friday, February 10 - ALL SCHOOLS CLOSED due to risky travel conditions throughout the morning and afternoon. 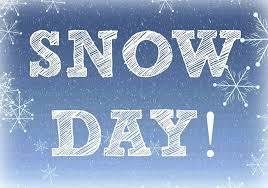 Thursday, February 9 - ALL SCHOOLS CLOSED due to the snow storm. Stay safe! Tuesday, February 7 - TWO HOUR DELAY for Schools due to potential icy conditions. EARLY RELEASE on Tuesday, 1/31 - High School at 12:10 PM, Middle School at 12:35 PM, Center/Memorial at 1:10 PM. Be safe in the storm! Tues. January 24 - TWO HOUR DELAY for Schools. Please travel safely! Monday, January 23 - All school activities after 5:00 PM are cancelled due to the possibility of sleet and difficult driving conditions. Activities and practices immediately after school will still be held. After 5:00 PM - all school events, practices, and activities are cancelled. Coffee with the Superintendent of Schools, Paul K. Smith, Friday 1/20 from 7:30-9:00 AM at 94 Main Street! 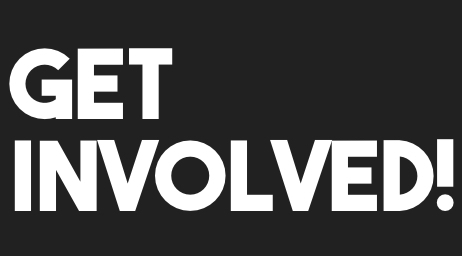 Superintendent's Advisory Council on Thursday, 1/19 at 9:00 AM - 94 Main Street. Information on 2017-18 Budget! All are welcome! 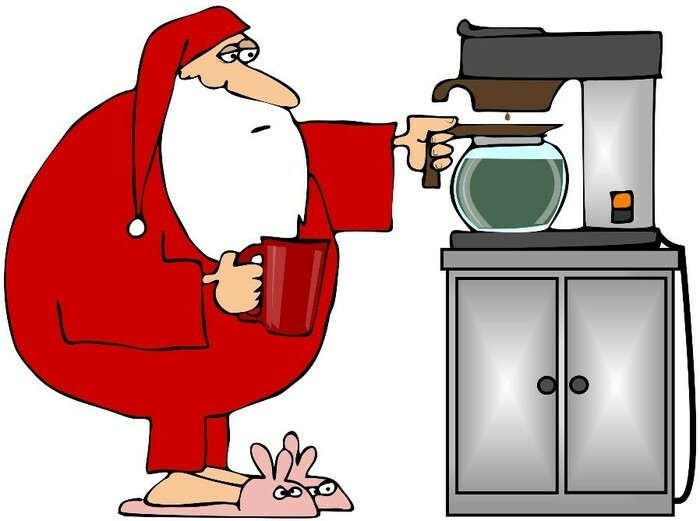 Take a moment during this busy season-join the Superintendent for "coffee & chat" tomorrow - Fri. 12/ 2 from 7:30-9:00 AM at 94 Main Street. 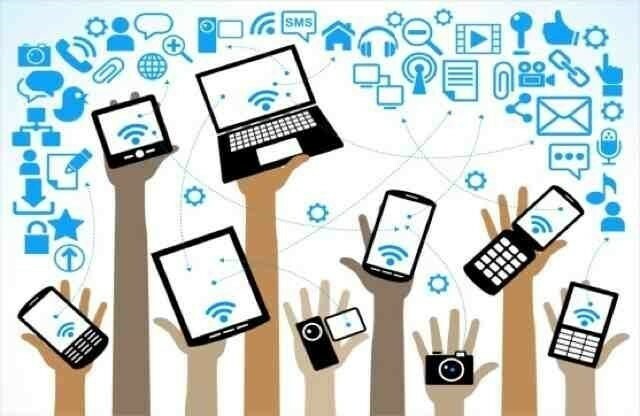 Parents: Friday, 12/2, Director of Technology, Rich Fielding will conduct a lesson on use of Twitter at East Hampton HS 7:45-8:30 AM. Tues, 11/29, Tri-Board Meeting in the High School T-Bell at 6:30 PM. The Town Council, Board of Finance, and Board of Education will meet together to begin the 2017-18 budget process. Just a reminder to families: Tues 11/8 - Professional Development for Teachers, Fri 11/11 - Veterans Day. No School on Tuesday or Friday. Reminder: No School on 11/8 - Election Day and No School on Friday, 11/11 - Veterans Day. 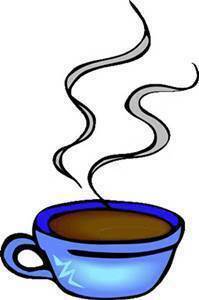 Coffee with the Superintendent of Schools, Paul K. Smith from 7:30-9:00 AM on Friday, 11/4 at 94 Main Street. Join the BOE tonight (10/17) @ 7:00 PM-EHHS to share ideas & suggestions for the 2017-18 Budget. We want your input! Child care available! Happy Columbus Day long weekend to East Hampton families. A reminder that Tues, 10/11 is a late start day for students due to Teacher PD. SAVE THE DATE: Monday, 10/17 – BOE Meeting -7:00 PM. Voice your opinion on budget items for 2017-18. All welcome. Child care available! 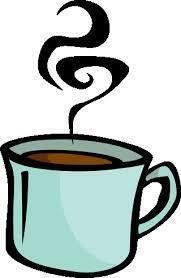 Friday, October 7 – Coffee with the Superintendent of Schools at 94 Main Street, 7:30-9:00 AM. Pumpkin spice coffee will be on tap for the meeting (along with other flavors)! Come and chat! Monday, 10/3/16 7:00 PM at EHHS: Board of Education honors 2016 Friends of Education. Also, information on the Charter Revision. 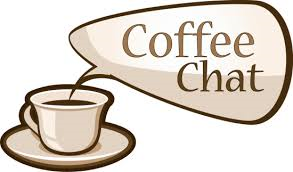 Friday, 9/23 from 7:30-9:00 AM, stop at 94 Main Street for Coffee and Chat with the Superintendent of Schools, Paul K. Smith. Thursday, Sept 15 - Superintendent's Advisory Council at 94 Main Street, 9:00 AM. Agenda: District Goals, School Safety, Town Charter. New East Hampton Schools' website debuts today! 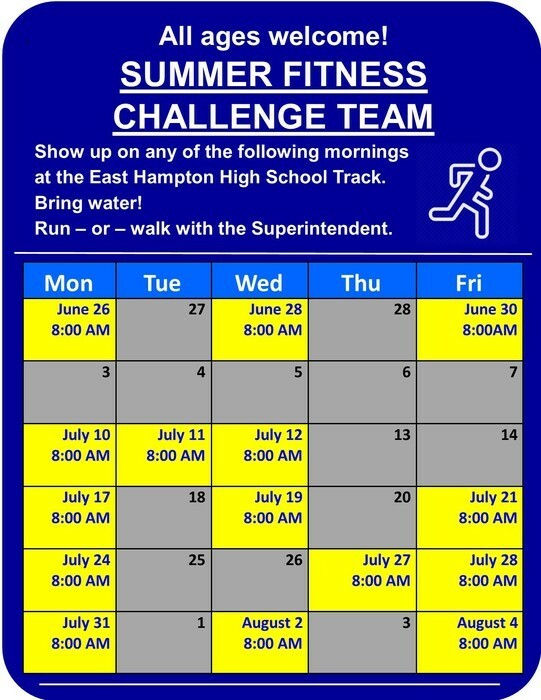 Check us out at www.easthamptonps.org. More features coming! 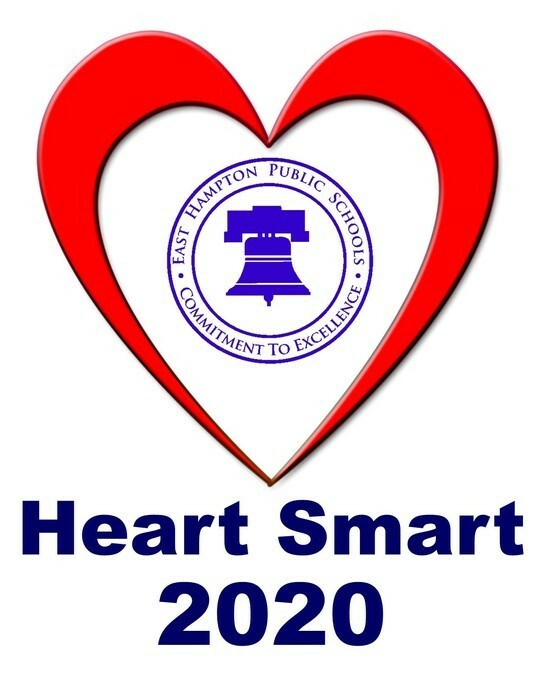 Heart Smart 2020 - East Hampton Public Schools newest initiative: Starting with Class of 2020 all students certified in CPR and AED! New wall mural revealed in East Hampton High School Cafeteria. We're looking forward to welcoming our students back on Tuesday, 9/6. Reminder: school starts on September 6!